A Mensa worker and former journalist who was diagnosed with cancer after visiting the GP with a crick in her neck is pledging to take part in Cancer Research UK’s Race for Life. Ann Clarkson, aged 53, who worked for the Express & Star’s sister paper the Shropshire Star, will take part in the event two years to the day since a successful operation to remove a tumour from her womb. Ann, who lives in Telford, visited her GP in April 2017 with a badly cricked neck. It was only on the way out of the surgery that she mentioned to the doctor she had been having some post-menopausal bleeding. "It wasn’t the main reason I went to the doctor - I just mentioned it in passing as I thought it was probably hormonal. If it hadn’t been for that crick in my neck and that chance conversation I wouldn’t have been diagnosed so early,” said Ann. Thankfully, Ann’s GP insisted on checking out the cause of the bleeding and referred her for an ultrasound and hysteroscopy. It was there that she saw a large grey mass on the ultrasound screen. "It looked like a big, grey mushroom with fronds coming off it. I could pretty much tell from the reaction of the staff that it wasn’t good news, but they had to send it off for analysis before telling me anything definite,” said Ann. Determined to get her head round her diagnosis before sharing the news with anyone else, Ann went to get the results of the hysteroscopy on her own. It was then she was told she had grade 3 womb cancer that could have spread anywhere in her body. After a CT scan Ann was told she needed a complete hysterectomy and removal of surrounding lymph nodes. After successful surgery at New Cross Hospital in Wolverhampton she was had chemotherapy and radiotherapy at the Deanesly Centre to prevent the cancer recurring. At one point Ann ended up in A&E because the effects of the chemotherapy were so bad. When chemotherapy finished in September she had to have four doses of radiotherapy too. Ann returned to work at Mensa in October as her hair started to grow back. "Unfortunately, it grew back looking like a 1970s’ Kevin Keegan perm, which was not a look I really aspired to,” joked Ann. Because there was a family history of cancer Ann had genetic testing but it did not reveal any known mutations. However, knowing that new discoveries are being made all the time, Ann agreed to allow her tissue samples to be used in future research to benefit others. This year, for the first time, Cancer Research UK is inviting everyone – women, men and children – to join the Race for Life. West Midlands events include Race for Life in Wolverhampton, Walsall, Dudley, Telford and Shrewsbury, plus Pretty Muddy events at both Weston Park and Sandwell. Last year Ann’s two daughters, Ellie,26, and Jennie,19, took part in the Telford Race for Life in celebration of their mum. This year Ann’s partner David Ballinger will join her on the start line at Telford Town Park on June 2 to celebrate two years since Ann’s cancer was removed. Ann said: "I’m so excited to take part in Race for Life and join such a formidable force of supporters who are so motivated to make a difference. The event falls on the exact day they told me they’d successfully removed all of my cancer so it is a significant milestone for me. 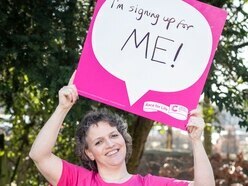 To enter Race for Life visit https://raceforlife.cancerresearchuk.org/ or call 0300 123 0770.